Since 2015, Kinder Australia has acquired the exclusive Australian distribution of K-AllShelter®/Capotex Conveyor Belt Covers. K-AllShelter®/Capotex belt covers deliver a robust, aerodynamic and lightweight solution that ensures personal safety from moving parts, suppressing dust and protects the environment. These are now issues that address growing environmental compliance requirements for Australian bulk materials handling operations. In many overseas countries, particularly in Europe and Latin America, legislations have been put in place that make it mandatory for conveyor belts to be enclosed with protective covers. OHS hazards and accidents from incorrectly using conveyor belts include conveyed material falling away during transportation, hitting and seriously injuring workers. There is also the potential risk of workers being dragged and/or entrapped within the transporting belt by clothing, hair and other loose elements. “Covering up makes sense not only helping to minimise or eliminate serious costly belt mistracking problems which can arise when moisture seeps into the cracks and extending the wear life of the conveyor belt. But also, ensuring the safety and instances of injury/accidents to workers is of paramount importance,” says Neil Kinder, CEO – Kinder Australia. The environmental and OHS risks of unprotected belts requires careful consideration due to the build-up of airborne dust during the ongoing materials handling conveying process. The risk to personal safety is very real, fine airborne dust particles create serious personal health risks when inhaled. Further safety considerations include the increased risk of slips, trips and falls in areas of poor access and visibility caused by dust emissions. There is also the risk to the environment, where dust can reach areas beyond the site boundaries. It can contaminate delicate ecosystems especially in wetlands and rivers, causing regulatory interest and rifts between nearby towns and the plant. Today’s extractive industries will constantly have their dust emission levels closely monitored and evaluated. Adherence to acceptable dust level regulatory standards set by industry bodies ensures continued site operations, productivity and profitability. 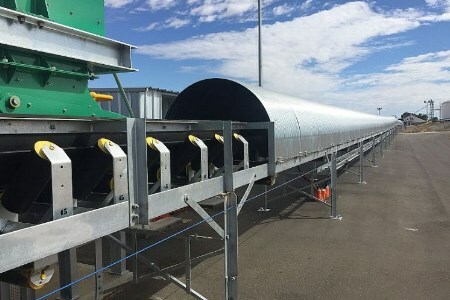 The tightening of environmental regulations and site obligations will mean all conveyor belts should ideally be enclosed to reduce the OHS risks and improve environmental impacts of dust emissions.